Tag line: "Stay home. Lock up. Don't breathe"
The Johansson family, father Dino (Troels Lyby), mother Pernille (Mille Dinesen), teenage son Gustav (Benjamin Engell) and young daughter Maj (Ella Solgaard), live in the beautiful suburb of Sorgenfri, where they lead a perfectly normal life (Maj spends most of the day caring for her pet rabbit, and Gustav is trying to hook up with Sonja, the pretty brunette across the street played by Marie Hammer Boda). But something strange has been happening to the citizens of this quaint community: they’ve been getting sick, and in large numbers. The news media issues the occasional update, telling residents that a new virus is spreading rapidly, and that they should call a special hotline if they or any members of their family becomes sick. And the authorities are quick to tell them that under no circumstances should anyone venture outside their home. 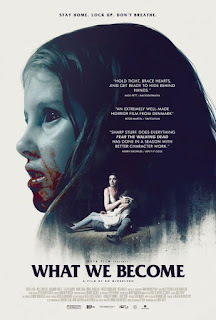 For most of its runtime, 2015’s What We Become, a Danish horror film written and directed by Bo Mikkelsen, tries to conceal what’s actually happening in Sorgenfri, so I have no intention of delving too deeply into it myself. That said, even those viewers who know very little about the genre will more than likely be able to figure out what the “virus” is, and the effect it has on the locals. The clues we’re given early on speak for themselves: according to a news report, eight residents at a neighborhood nursing home have suddenly become critically ill (for no apparent reason); and later on, while attending a community picnic, Gustav spots a small child, who moments earlier was playing with his friends, doubled over and throwing up. The next day, a car crash occurs near the Johansson’s house, and when Dino investigates he’s horrified to find the driver’s dead body lying in the middle of the road. A police car and ambulance race towards the scene… and pass it by. Clearly they had something more pressing to attend to. We’ve seen all this before, and if What We Become has one weakness, it’s that it brings nothing new to the table. Yet thanks to the fine performances delivered by the entire cast (especially those who make up the Johannsson family), as well as the way director Mikkelsen manages to generate tension throughout (even in those scenes where we know what’s going to happen before it does), What We Become is a film I would happily recommend to horror fans. Sure, it’s a routine entry if every way imaginable, but it’s also a good movie, and in the end, that’s enough to make it worth your while.